Action speaks louder than words. 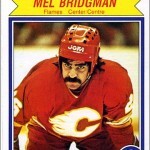 Upper Deck took that meaning to heart when they started making hockey cards in 1990. 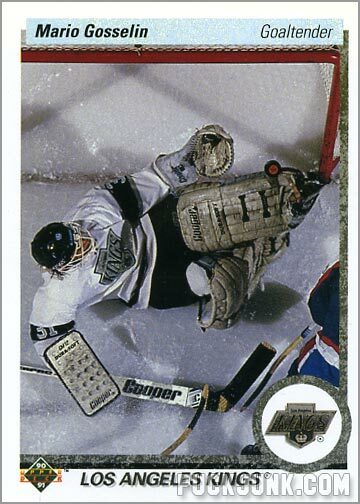 This card you see here, of Los Angeles Kings backup goaltender Mario Gosselin, was one of many cards that demonstrated that Upper Deck was serious about becoming the best hockey card company out there, with their blend of high quality products and exciting action photography. While hockey is the most exciting sport in the world, you could never really tell by looking at trading cards from before 1990. Every now and then, you’d have brief glimmers of excitement, such as Parkhurst’s “action” cards from the 1950s, or O-Pee-Chee “Super Action” or “In Action” cards from the 1980s. When Upper Deck entered the scene in 1990, super action was a rule, and not an exception. 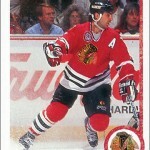 This card of Gosselin was mind-boggling – almost incomprehensible – when it was released during the 1990-91 season. A dynamic, overhead view of the goalie making a save right on the goal line – notice the puck teetering delicately on his left leg pad. 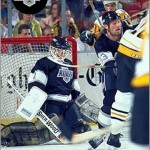 Before then, we never saw photos on hockey cards this exciting. 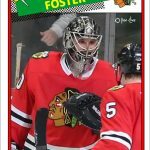 Most cards of goalies – especially in the past two decades – were either of them skating around in the pre-game warm-up, sitting on the bench or portraits. Even today, you rarely see photos on cards this good. The back of the card is almost as awesome as the one on the front. 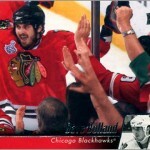 Instead of putting complete stats on the cards, Upper Deck would opt to use two-thirds of the back for another photo – sometimes a close-up or portrait photo, and sometimes another action picture. 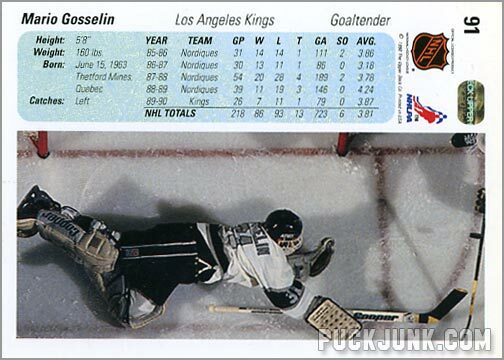 On Gosselin’s card, we are treated to a second overhead photograph. This time, he’s sprawling out to sweep the puck away. This photo would have been good enough to put on the front of most other cards.